PGAC is the perfect setting for an intimate wedding reception, shower, birthday, or business event. 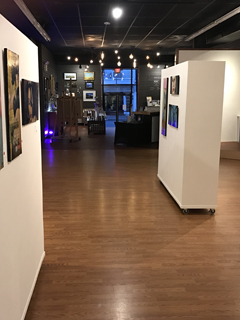 Our Gallery is modern, clean, neutral, has beautiful art and versatile lighting and can be easily decorated in the theme of your choosing. The space has 11 foot ceilings and can comfortably accommodate up to 70 people. Please contact us via email or (856) 553-7757 for pricing and availability. 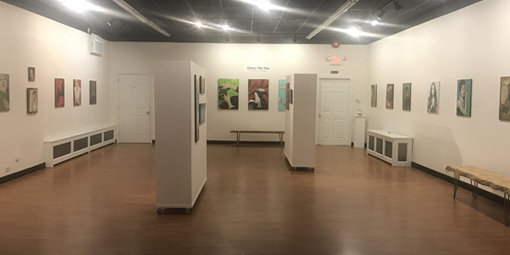 *Please note: Space rental is not available on the first Friday of each month for our Artist Receptions. PGAC proudly recommends the use of our event partners, Rosebud Floral Art and Giovanetti Catering. What if I don’t need the entire half day? In our experience, even a short event takes substantial set up and clean up. Committing the space to the event for half a day makes set up and clean up more relaxed for you and makes scheduling other activities during the same day simpler for us. Our half day rates are generally less than three and four hour rates at other venues. How can I know if the space is available on my preferred date? Please contact us via email or (856) 553-7757 for availability. Does PGAC have kitchen facilities? 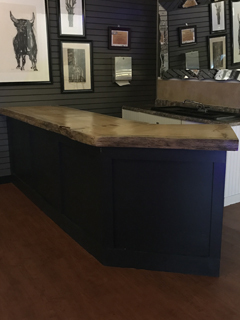 We do not have kitchen facilities, however we do have a spectacular wood slab counter/bar, a small refrigerator and a sink which make an ideal site for a beverage station or minor clean up. There is on site parking available for a catering van. Guests are responsible for their own set up and clean up. I don’t want to set up/clean up? These services can be provided by PGAC staff for an additional charge. PGAC does not provide alcoholic beverages. Guests are welcome to bring wine or beer. If additional and/or different furniture is desired WHY BUY? Rents chairs for $1 a piece and tables for $2. What types of decorations are allowed? Balloons, flowers, special lighting, tablecloths, signs, almost anything you can dream up. What types of decorations are not allowed? PGAC can easily accommodate a group of three or fewer musicians playing acoustic instruments or small amplifiers or a DJ. Parking for the host’s vehicle is available in the small lot behind the building. For guests, during the day free parking for 3 hours is available on street and in multiple borough lots. For unlimited daytime parking, spaces are available around the edges of the business district. For nighttime events, the three hour limit expires at 8PM, so a vehicle parking in a time limited space at 7PM will not exceed any time limit and may stay indefinitely through the evening. See the map here. Our space is elevated at the front door, however, there is wheelchair access with a small ramp from the back door. Once inside, all but the front window space is on one level. Our 2 restrooms are also wheelchair accessible. Of course! We welcome reasonably well behaved children of all ages. PGAC offers special discounts to non-profits. Call us to talk about your event. Contact us to reserve your space.